The Grand Theft Auto series, which was originally released for the Playstation and PC back in 1997, is one of the most popular action / role-playing franchises of all time. Along with the console and PC releases, Gameboy and PSP versions of the game have given mobile gamers the opportunity to carjack and pillage on the go (with a Nintendo DS release set to debut in March). And, while we haven’t heard that Rockstar Games has plans to bring GTA to Apple’s mobile platform, tonight mobile gamers are getting the next best thing. 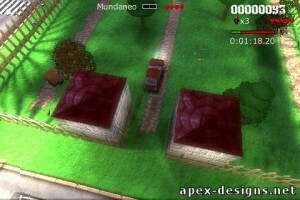 Apex Designs has just (re)released Payback [App Store] for the iPhone and iPod touch. And in the original author’s words, “every effort has been made to ensure that Payback beats GTA in every way." Payback started life as an Amiga clone of Grand Theft Auto [info]. 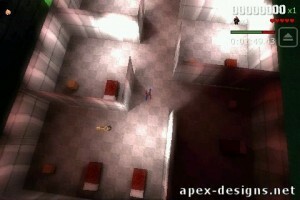 Apex Designs brought an enhanced version of the game to the Macintosh, Gameboy Advance, and GP2X. Early this month, the developer informed us that the iPhone version was near release. Payback features dozens of vehicles and 11 cities to explore. The player starts off each city on-foot and must get to a payphone to receive mission details. At first, the player’s only weapons are his fists, but crates scattered about the cities contain shotguns, grenades and other weapons that aid significantly in wreaking various flavors of havoc upon the cities’ inhabitants. Each level requires a certain number of accumulated points to complete. Points are gained by completing mission milestones, running down civilians, and generally causing mayhem. The more mayhem the player causes, the more of a target he / she becomes to local law enforcement. A particular challenge of the game is the short timeframe given to complete certain missions. Admittedly, I’ve spent only a short time with the title, but some of the allotted mission times would seem to require back-of-the-hand familiarity with a given city. The game features accelerometer control for left / right movement and touchscreen control for forward / backward movement as well as fire and enter / exit vehicle controls. Having played the joystick-based GP2X version, I can say that the control system of Payback for the iPhone compares quite favorably. It works well and is not in the way. Payback offers three modes of play: Story, Rampage and Challenge. Story mode places the player in the role of a criminal seeking to amass as much money as possible in moving from city to city. Challenge mode offers all of the cities of Story mode plus a variety of smaller arenas–more of a pick-up game scenario. Rampage mode has no requisite score to move from level to level, it’s just about getting the most points possible. Payback for earlier mobile units won kudos for its relatively complex software 3D rendering engine that pushed the limits of both the Gameboy Advance and the GP2X (neither of which feature 3D graphics hardware). The iPhone version appears to include an enhanced version of the GP2X engine with HDR (high dynamic range) rendering and impressive lighting and shadowing. Not surprisingly, the iPhone version runs at a notably higher framerate than the GP2X outing. Interestingly, it appears that Payback’s 3D engine for the iPhone version is not implemented in hardware-assisted OpenGL ES, but utilizes a software-based engine like the GP2X version before it. Is this a big deal? Not really, though true, perspective-correct texture mapping done in hardware would have given the game a bit more graphical polish. 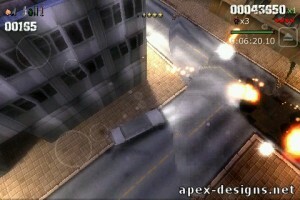 Moving through the game’s various cities, tossing grenades at oncoming vehicles and pedestrians, carjacking fast rides, and gunning down rival gangs makes for rather engrossing gameplay. Payback is a fast-paced game and the never-distant sound of police sirens add to the overall pacing and urgency. For fans of the genre, it’s fun, solid action. Having played both the GBA and GP2X versions of the game, I can say that the iPhone version of Payback is easily the best yet. It does a solid job of delivering the essence of the experience that is Grand Theft Auto and Grand Theft Auto II to the iPhone platform. Fans of the series will find that Payback hits close enough to home to be of particular interest. Have a look at our gameplay video to get a feel for the action and the various levels. The developer has also posted a video on YouTube showing additional action including some tank warfare. Payback is basically GTA I and II for the iPhone. It’s a 3D, top-down action/ role-playing game that captures the essence of Rockstar’s original. Fans of the series will enjoy this iPhone outing.